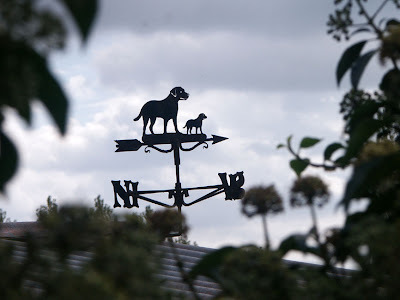 We have posted pictures of various windvanes before, but ths one in le Petit Pressigny had escaped our attention until recently. While Kippa and Ben were here we took them to see La Gargantua, a prehistoric monument not very far from Preuilly. The scene looks out over the valley towards Charnizay, and this field is full of skylarks in the summer. It's a lovely place. The senior bossyguts cow, hogging the molasses lick (below). I suspect the collar is to indicate that she has been confirmed as in calf. 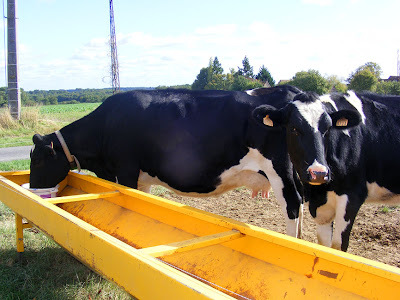 I expect the milk from these cows goes to the co-operative in nearby Verneuil, which is apparently one of the top three butter producers in France. October has been a mixture of clear bright sunny days and misty moisty damp days. 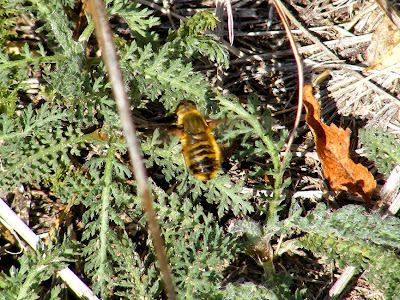 On the sunny days, all the late summer insects come out to soak up some rays and strut their stuff for the camera. And now a message from our sponsor, Pissed off of Preuilly: I would like to announce that this is Day 7 with no voice. I haven't been able to speak above a whisper for a whole week! In French, I have l'extinction de voix. Will I recover in time to telephone the woodman and order more firewood before we run out? 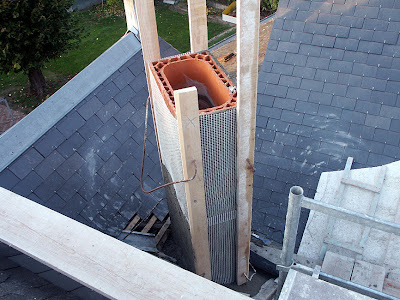 Can we pay the mason for the new chimney if I can't phone the currency exchange to arrange to buy euros with Australian dollars? 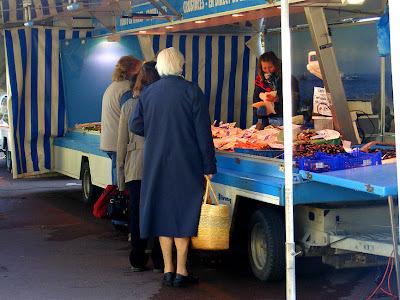 Susan wrote yesterday about the marché in Preuilly sur Claise. 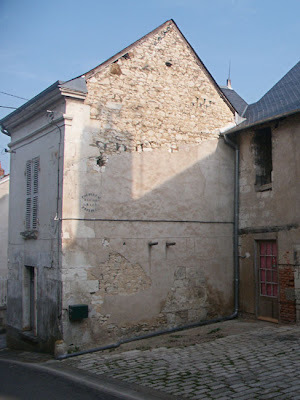 There are some items which you can't get in the market, and sometimes we get "pub" (advertising) through the letterbox and this often results in a drive to the supermarket, either in Yzeures sur Creuse or la Roche Posay. I am sure that everyone can relate to this. I mean- we ALL have to drive to the supermarket. I would hate anyone to think we were showing off or anything! ps Abbé Henri Proust has written here about Célestine's visit to Richelieu. 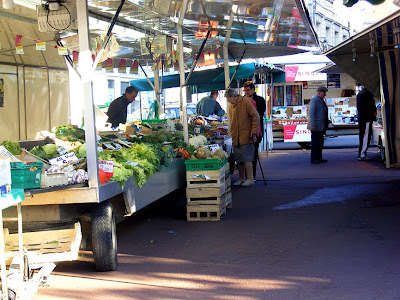 Preuilly has a market twice a week, on Thursday and Saturday mornings. They get underway from about 09.45 and finish by noon. Different stalls come on Thursdays to those who come on Saturdays. On Thursdays we get rabbit and chicken products; fish; goats' cheese, eggs and honey; fruit and vegetables; meat; plants; fruit from a local orchard and vegetables from the potager next to ours. In addition there is sometimes another fruit and veg stall, organic produce and the sewing machine and vaccuum cleaner van. On Saturdays we get a different fruit and veg stall and a different local market gardener (who is by far the most popular veg supplier); there is also dairy products; oysters; clothing and sometimes wine. The market isn't just a place you go to stock up on fresh local food though. It's where you go to meet friends and network. I once went to the market and bought nothing, because I chatted and caught up with so many people I ran out of time. My progress through the market went something like this: ran into Jill and John and caught up on their news [English spoken]; Bengt and Suzanne arrived to catch the bus to Tours, so we all chatted till the bus came and I said 'hi' to Felix who was also waiting for the bus [mostly English]; arranged with John and Alice to pick up a plant from their place over near Boussay [mixture of French and English in equal quantities]; Bernard de la Motte spotted me and we discussed how best to deal with Bâtiment de France - I had emailed him for advice and he had simply waited until he saw me at the market to respond [French]; had a conversation with Louisa about remote working and discussed how we might help a mutual friend about whom we are concerned [English - well, American in her case...]; spoke to our neighbour Guy L about the petition to save the post office [French]; bumped into another neighbour, Sylvie, at the baker's and we walked home together, with me practicing 'roue' and her practicing 'Farrow and Ball'*, in between hooting with laughter like schoolgirls and talking to Valéry, who was up on a scaffold repairing his roof [French]. *Farrow and Ball is a British paint company specialising in high quality paints which are particularly suitable for historic buildings. They have a distributer in La Roche-Posay, and Sylvie is in the process of decorating her house. Watch out for mayflies ?!! In October ?! 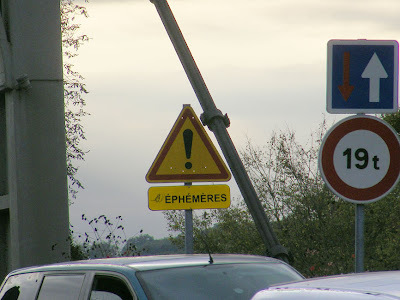 I first noticed this temporary warning sign on the bridge at Bonneuil-Matours on 10 October. 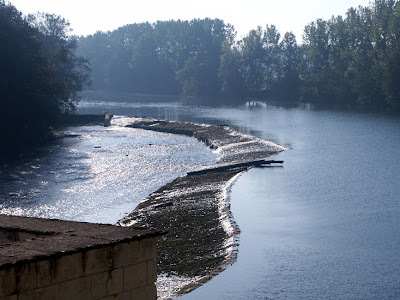 I assume it is warning of a mass emergence from the River Vienne below of some late summer emerging species of mayfly like the Burrowing Mayfly Ephoron virgo (known as manne ie manna by French fishermen), which can emerge in vast numbers for a few days from big slow rivers like this. The mayflies are strongly attracted to the lights on bridges and end up coating the road surface, making it slippery from the body fat they store to get them through their short adult lives. 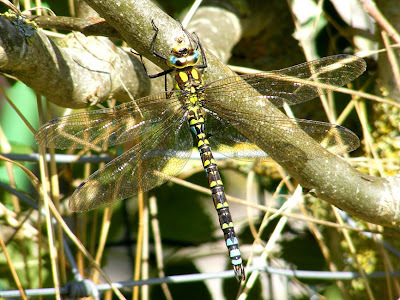 Many species of mayfly are extremely sensitive to modern agricultural chemicals, so it can be a sign that the water quality here is very good and unpolluted. 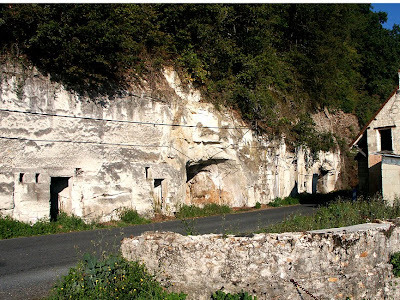 The Touraine is riddled with underground passages and quarries. Even the shortest drive will take you past at least one, with its entrance temptingly open to the road. Many of them are seemingly empty and some of them are complex systems of interlinking chambers and passageways going deep into hillsides and cliffs. At the Château de la Celle-Guenand, there is a network of passages under the main building, like a rabbit warren, with multiple entrances / exits in the village, as well as within the château and grounds. They date from medieval times and were an additional means of protecting the occupants, allowing them to come and go in secret. Nowadays, many of the tunnels are blocked up and a lot of them are too small for comfortable exploration. Steve Palluel, who with his partner, owns the château and runs it as an event venue and holiday accommodation, was kind enough to offer a private tour of the tunnels and so while we had two 19 year old boys staying with us, we thought it would be a good opportunity to take him up on the offer. We also got to see the caves (also man made) at the back of the château, which, somewhat to Steve's alarm, run underneath the neighbours' gardens. He worries a bit about them collapsing, but like many old structures, they've been looking parlous for decades without any real change. I was interested to note that there are no signs (eg guano) of bats roosting in the caves at the château. At this time of year, many bats switch from their summer roosts in trees and buildings and move in to a cave for the winter. 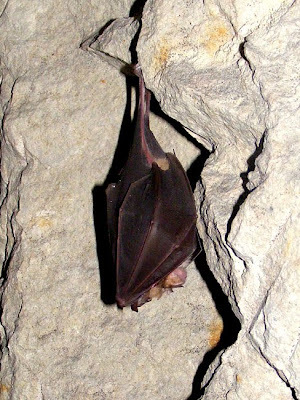 Bats can be very vulnerable during their winter hibernation if they choose a cave that is easily accessible, and if you want to explore the souterrain, you must remember that all bat species are totally protected in France. It is an offence to disturb hibernating bats, because to do so reduces their survival chances. If they are roused from their torpor, they use vital energy, which can result in them not having the reserves to get through the winter. 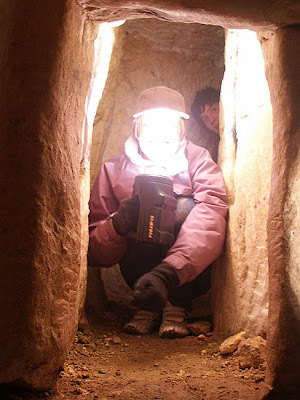 Always bear in mind that you may not be the only curious person poking around in a cave over the course of a winter, and once you notice that a cave is being used by bats, you should exit quickly and quietly, without shining your torch around too much. The troglodyte complex at Gatineau below. Vienne Nature has posted a warning about disturbing bats here. I assume there are Greater Horseshoe Bats in residence, as I found one dead on the roadside 10 days ago. In the neighbouring départements of Vienne (86) and Indre (36) you will often come across notices at cave entrances, reminding you that bats are protected. This is an indication that the site is a known bat roost, and you should not enter. Our département, Indre et Loire (37), is much less likely to post warning notices, and I know of one cave, very easy to access, which has at least four species of bats currently hibernating in it. Fortunately, there is no evidence that they are in danger of deliberate disturbance. I suddenly realised yesterday evening that it is a week since Kippa and Ben departed. This came as a bit of a shock, because it feels like we haven't done much since. We have just had one of those weeks; Saturday and Sunday we enjoyed first use of our fireplace and cleaned the house from the mason's activity, on Monday the masons returned to finish the outside of the chimney, on Tuesday and Wednesday we did more cleaning (stone dust is incredibly fine and will take weeks to get rid of) and reorganised the furniture in the front room (which involved moving bookcases a couple of times), and on Thursday we took Célestine for a little drive. I want a good, solid, retractable clothesline, but they appear to be an Australian thing. I had a retractable clothesline in Australia that lasted 10 years, but for some reason the French (AND the English, before the visiting Anglos get too smug) all use incredibly flimsy, minute, cheap and nasty looking things. I want this. You will notice that it is made in Australia. 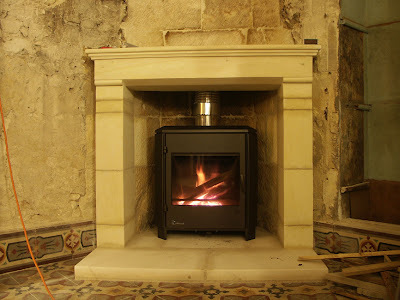 It is available in the UK, but it costs a lot of money (for our installation it is just on £200 delivered to the UK). If I want it delivered to Europe by the UK company I have to order in Euros - and they add over 100€ to the cost. 100Euros - for doing a currency transaction!! That is almost as much as the clothesline originally costs in Australia, so I will be emailing the manufacturer and asking if they can send me one directly from the factory. All that to get some clothes dry! Almost exactly a year ago (and this is purely coincidental) I wrote about how much the river level at the weir at Gatineau changes. Last week we went past the weir with Kippa, and were amazed to see how low the river was. We know that this year has been incredibly dry compared to the last two, but it was still a bit of a shock. The river won't be this low now - it has rained fairly heavily the past couple of days, and even the Claise is flowing again. This is the first time we have been in Preuilly in late October, so have no idea if this is typical weather for the time of year. 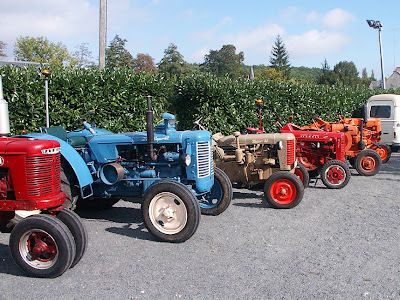 One of the attractions at the l'Art et Lard festival was a display by the le Grand Pressigny machinery club. The do have a couple of members who own cars, but the emphasis appears positively agricultural. 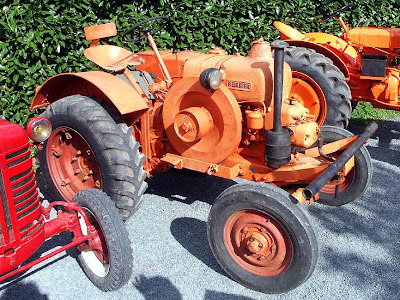 I kind of like tractors; there is something appealingly basic about them, but I am not sure I will ever own one. Let's face it, with Célestine in the garage we would have no room for one anyway. When we lived in Queensland we were near the Jondaryan Woolshed, which has a large collection of antique farm machinery. 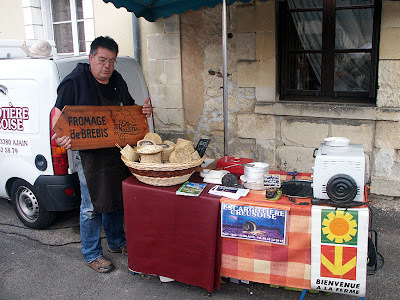 Some of the brands we saw in le Petit Pressigny, however, we had never seen (or heard of) before. We've had our first delivery of wood from one of the local firewood suppliers, Monsieur G. He's a farmer, but sells good quality properly dried oak for firewood as well. Because Simon wasn't as organised as he could have been (something he will willingly admit to) the wood was delivered into the back garden. We cleared a stack of old pine that had been the decorative motif in the kitchen (and will now be kindling) into an organised heap, and later transferred the new wood into two smallish heaps (one for big logs, one for middle sized) in the garage. This will keep it dry - essential for firewood, and sensible considering the wood has been drying for almost two years already. None of the wood will require any form of splitting or cutting, which is good news. Prices around here range from about €40 to €60 a stere (a cubic metre). We paid €23 for a demi-stere, cut to 50cm lengths, delivered in the back of Monsieur G's station wagon (estate car in British English, or in French, break). He says this will last us about 15 days, and so far we are really impressed by how well it burns and how long each log lasts. We also liked the fact that he delivered the day after I telephoned him, and turned up at the time we arranged. Monsieur G was recommended to us as a reliable supplier and we will certainly be using him again. 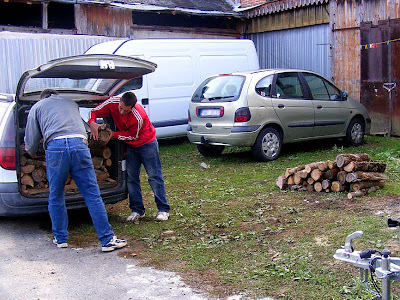 Next time we order wood, we will get 2 or 3 stere, which he will deliver by tractor drawn trailer. He's not totally confident he can get up our driveway with the bigger rig though, so we might have to manhandle the next delivery from the front courtyard to the garage at the back. Our chimney is finished, the scaffolding is down, and the masons departed. Searching back through the photos we have taken since we bought the house (almost 25,000 of them) I have managed to find three which show the evolution of our chimney. 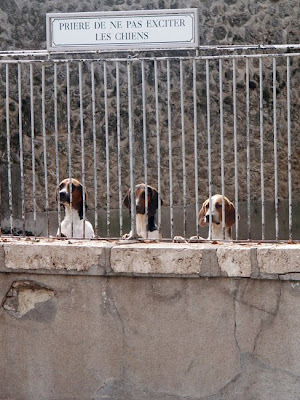 The first photo was taken in May 2006, on the day we had the house surveyed and a report done. 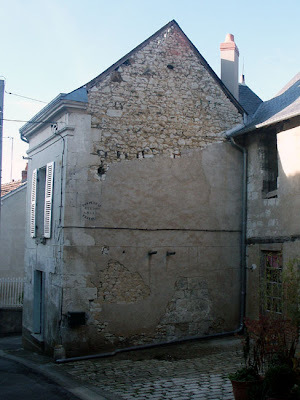 It shows the chimney in poor condition, as well as the hanger at the front of the house. The second photo shows the roof where the chimney used to be. The old chimney was demolished by the roofers in September 2007. 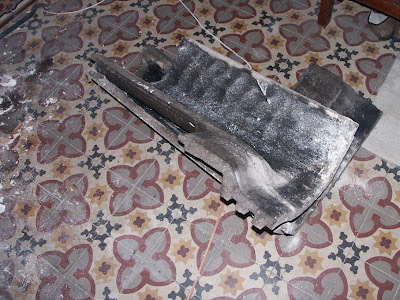 Poor leadwork around the chimney (and all around bad maintenance) were responsible for the hole in the roof which caused the old staircase to collapse. 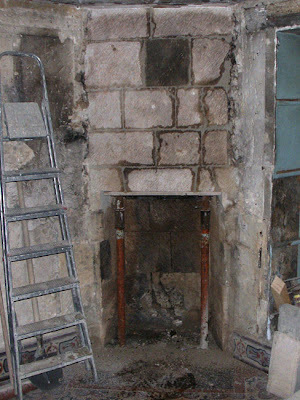 The third photo is the chimney as it is now. 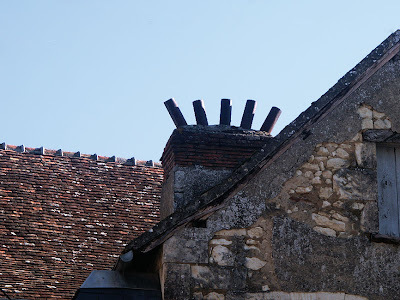 It is on the same alignment as the old chimney, but is only half the width. The old chimney had two flues, one for the salon, and one for the upper chambre which we have dispensed with. When we bought the house neither room had a working fireplace. I photographed these White Bryony / Bryonia dioica / Navet du diable berries in early October, looking like beads strung along our potager fence. 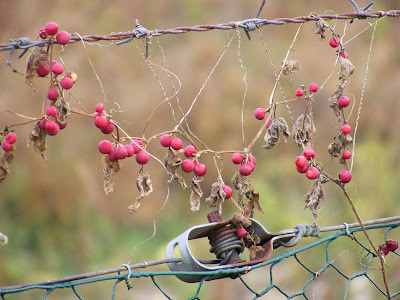 The plant twines and scrambles over the fence and across the ground. 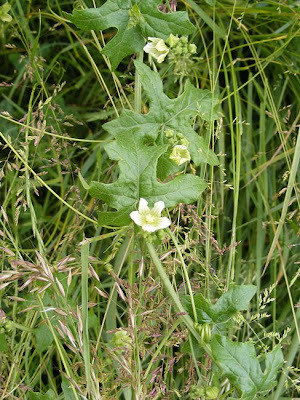 Like many plants in the cucurbit family, the fruits are powerful purgatives, and if sufficient are ingested, can cause death. Here's what the plant looks like in late May. We picked up Célestine from the M. Musseau a week ago on Saturday. While we were there he measured us up for a new numberplate (plaque d'immatriculation). We have been lucky with the transfer of ownership of the car, because we were just in time to get one of the old style registration numbers. If we had left it another week we would have been given one of the new style numbers which doesn't include the département number. That would have meant we wouldn't be able to have a plate which is white characters on a black background. 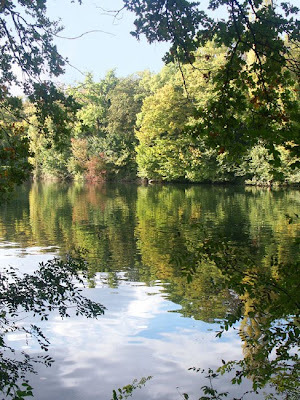 On Sunday we went for a drive in the countryside - through the Forêt de Preuilly and Obterre, the two Pressignys (the big one and the small one) and Chaumussay. 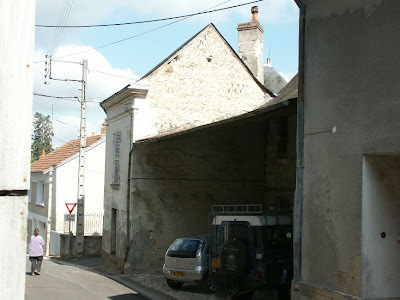 On Tuesday we took Kippa and Ben to Cheverny, on Wednesday I visited Nick and Jean and we had a little roll around the countryside and on Thursday we had a little excursion to La Celle Gurnand (on which Susan will write later). 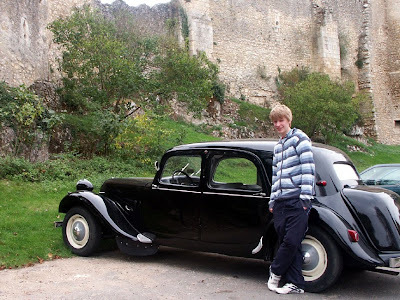 On Friday we took Kippa to the airport in Poitiers via Angles sur l'Anglin. We have all really enjoyed getting to grips with being with Célestine on a long term basis. After her visits to M.Musseau she starts first time nearly every time, she doesn't splutter when you put your foot on the accelerator, and she is a lot quieter since the various holes in her exhaust were welded. Driving her is a pleasure - there is no imperative to rush, and people don't seem to resent you slowing them down. We get waved at by old men and children, and even Porsche drivers wave or flash their headlights. In return I reward them with a crunch of gears, a habit I am working on overcoming. It has been very cold the past couple of days. Yesterday morning the temperature was in the minuses (-2 according to the thermometer in the car), and we haven't had any heating except for a couple of cheap electric heaters. Even the heaters haven't been very effective - the chimney was open to the skies, so any hot air we did manage to generate disappeared instantly. This meant that Thursday night and Friday morning were pretty miserable. 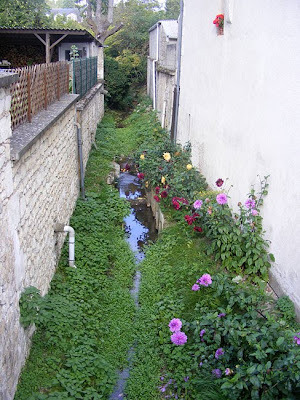 A riveau reuil (rill) between two properties in Preuilly. I particularly like the pelargoniums on the window sill of an otherwise blank wall, and the pears bobbing about in the stream after falling from a tree further up. Note: a riveau seems to be a local word for water meadow. 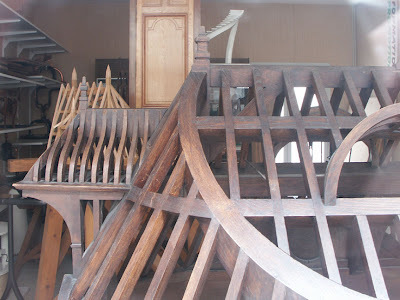 When we arrived home on Tuesday evening after our visit to Cheverny we found that the builders had left the ladder in place so we could climb the scaffolding. Not only did this let us inspect the new chimney (coming on nicely), but it also gave us a new view on our home. by the hollow terracotta blocks which are then rendered. 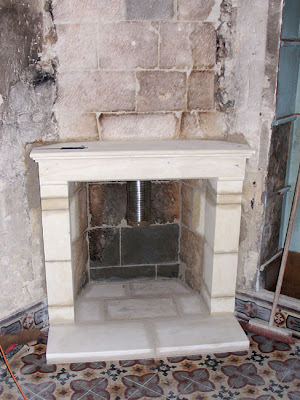 Yesterday morning we asked M. Douady how to clean the stonework we have uncovered above the fireplace, and he set to cleaning the stones by chipping away at the faces. This gives us a very antique looking, semi-clean finish. This is how the fireplace looks at the end of Wednesday. The dark block is a new piece of stone M. Douady has painted with a mixture of ash, sand and dust mixed in ordinary water. It was very white compared to what we had before, and once he is finished we should not be able to tell the difference. Tomorrow they start putting the fireplace in. It's a recovered piece from a house the same age as ours, in simple tuffeau (soft limestone). Outside, the chimney is rendered, and has a couple of courses of brick as a decorative top. Unfortunately it cant be seen at the moment from the street, as the scaffolding is in the way. Maybe I should use the scaffolding to erect our satellite dish before they leave. 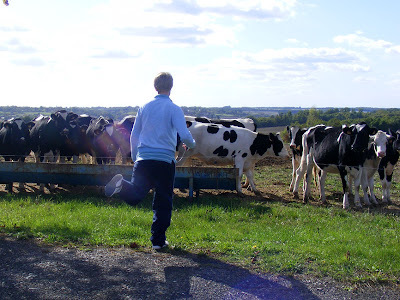 Yesterday we took Célestine to Cheverny, along with Kippa and Ben. This meant leaving home at 9.30, while the mist was still lying quite heavily on the ground. 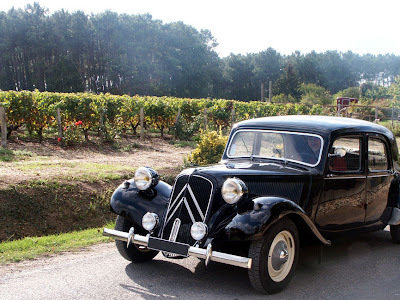 Luckily, with Célestine's improved electrics we were able to have the headlights on so people could avoid us. The trip took 90 minutes, and includes the first time I have overtaken motorised transport (a tractor, but it counts!). Cheverny is a great day out. 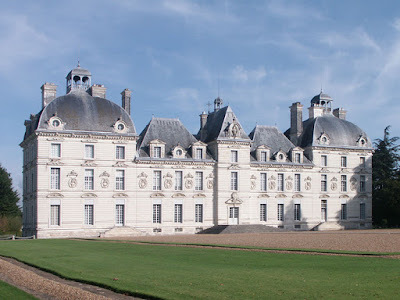 The Chateau is full of amazing and interesting furniture, the hunting pack are entertaining, and because the chateau was the model for Marlinspike Hall in the Tintin comics, there is a Tintin exhibition for kids of all ages. 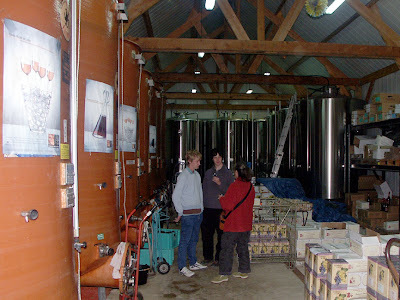 After Cheverny we went to the Simoneau winery to introduce Kippa and Ben to Loire Valley wines. We also had a chance to sample this year's very new bernache; still sweet and fruity and not very fizzy. The sweetness will fade and the fizziness increase (up to a point), after which stage it becomes almost undrinkable. We had a great day (even though I am suffering an allergy to all of Monday's dust) and as usual the car atttracted a lot of admiring glances. 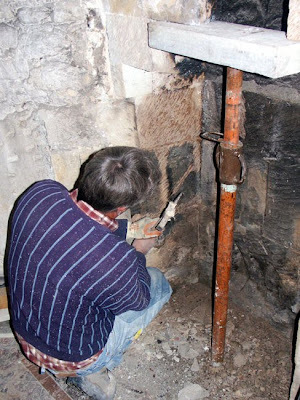 M. Douady arrived yesterday morning at 9 o'clock to start work on the chimney. Once again we have been impressed with how workmen here arrive and just get on with the job. We gave them a cup of coffee, and then they worked until midday. After lunch they worked until 5.30, when M. Douady joined us for an apéro. 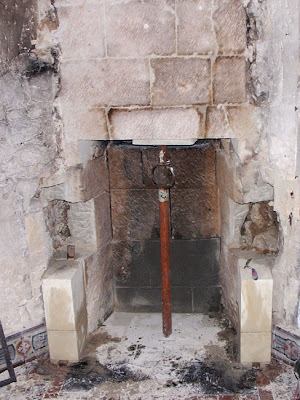 I was sort of surprised to see that the old fireplace (brown marble) was actually cement - painted brown marble. I knew it couldn't have been real marble - it would have taken an enormous block of stone to carve the deep releifs out of - so I don't know what I was expecting to see. One of the things M. Douady did yesterday was remove the terracotta bricks from above the old mantlepiece, exposing some stonework we didnt realise we had. We have decided to leave the stone on the chimney breast exposed once our new fireplace is installed. 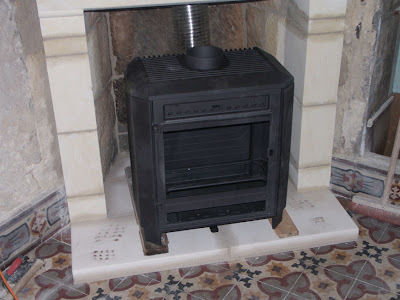 It is on an internal wall, so there is no need to insulate, and the tuffeau of the fireplace should match the tuffeau of the chimney breast nicely - after it has been well cleaned, that is. Work on the chimney (and fitting the fireplace) can't happen too quickly - it was very cold last night, and is expected to be down almost to freezing by the end of the week. 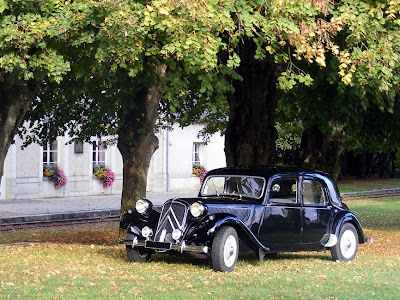 They may be pronounced the same, but we were in no danger of mistaking one for the other at the Fête d'Automne yesterday in Le Petit Pressigny. The bacon (along with all the other food on offer) was excellent, as was the art that forms the other half of the festival. 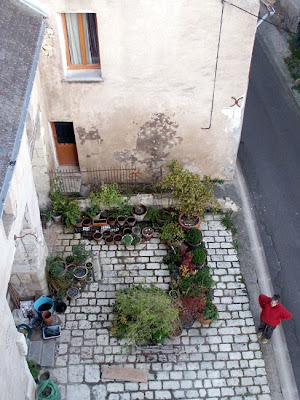 This is a great concept, whereby people in the village with suitable caves, terraces, barns and decks offer their premises as a display space for participating artists. To view the works and mini exhibitions, you pick up a map at the welcome stand and head off around the village. A great way to get a look at what is behind the garden wall. We were especially pleased that 'Miss Haversham's place' was open, showing the work of Treb, who makes amusing small scupltures in iron. In the salle de fête, Alain Plouvier was exhibiting his African influenced mixed media paintings, reminiscent of tribal textiles. If you want to see these works, he's having an exhibition at Galerie Sanaga in Tours from next week. I also liked the peasticks wrapped in clingfilm decorating the lavoir, the drawings made by scratching through black paint on glass, and I was very pleased to talk to the man who was combining painting and various photographic techniques including cyanotype (which is a medium I have worked in many years ago). The food vendors mostly set up stalls in the carpark in front of the church, and there was some very interesting produce available. 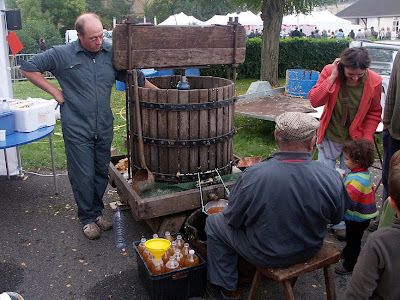 Someone had an apple press and was producing jus des pommes on the spot. We were told to keep our bottle in the fridge with the lid unscrewed a little, because after a few days it will have produced enough gas through fermentation to explode. 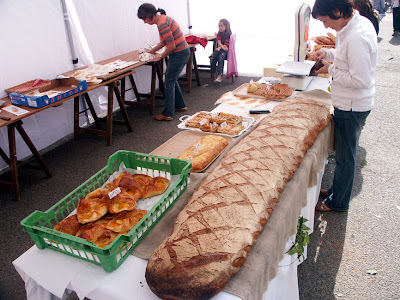 One of the local bakers had made several enormous loaves of bread. She said they were each 12-15kg of dough, baked for 2 hours and making a loaf 2m long. We also bought half a brébis (ewe's milk) cheese, aged for 3 months and made in La Nouaille (situated in the neighbouring region of Limousin). We could have had lunch of andouillette and frites, or the menu offered at the salle de fête of salade tourangelle, ham in garlic sauce, cheese platter and apple dumpling, or lunch at the Michelin starred La Promenade or le Bon Coin workers' café across the road. 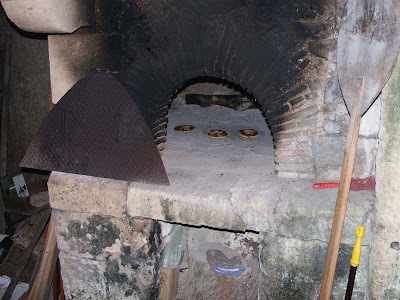 Instead we opted to go up the hill to a house with an old bread oven, which they had fired up and were cooking homemade pizzas. The topping was tomato puree (homemade), cheese and a thick slice of bacon. One of the best pizzas I've ever had! It was great to see how popular this event was - deservedly so in our opinion. The quality of both the art and the 'lard' was a cut above most village fêtes I've been to. The art was not the usual polite watercolours and garish oils, but a real mix of creative, interesting work; and it was good to see so many really knowledgeable, passionate food producers. 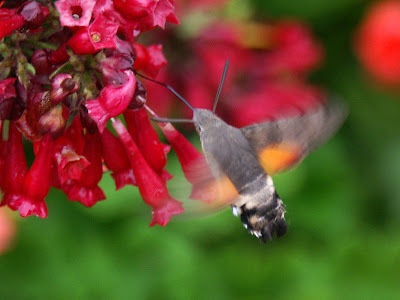 Several people in the last month or so have asked me to identify what they describe as a hummingbird they've seen hovering in front of flowers while its long tongue probes for nectar. 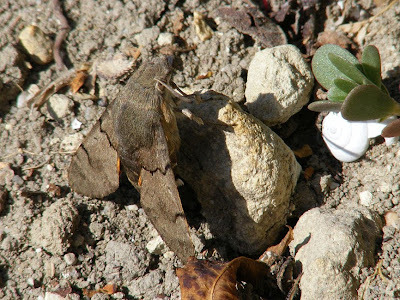 These delightful little creatures are Hummingbird Hawkmoths / Macroglossum stellatarum / Moro sphinx, which arrive in the spring and stay well into the autumn. Although they probably breed in the area every summer, so the second generation will be 'local', I suspect they don't survive the winter this far north, and every year, the population is replaced by migrants from the south of France. 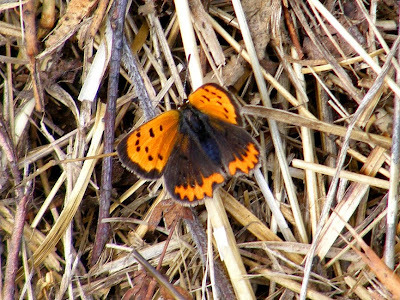 The species is very strongly migratory, reaching Scandinavia in a good summer. This year, for the first time, I have seen them at rest, both times in our potager, and even managed to get a photograph. Silent, but so charming, it is particularly good if you click the fullscreen button (bottom left-hand corner). 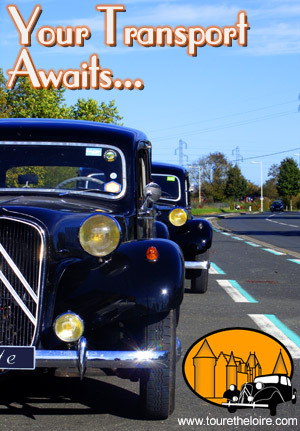 Route Nationale 7 is the route from Paris to Italy via Lyon. For any of our French readers of a certain age I am sure this will be très nostalgique. Célestine is still with the Garagiste, but we are collecting her this morning. After spending two weeks in the workshop her battery was "un peu plat", and he thought it would be best to fully charge it for us. This meant we were unable to collect Kippa and his mate Ben in style from the airport, but at least we will have her available for a trip or two next week. Not the building itself, but the content. 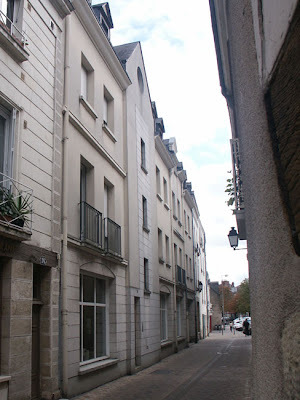 Number 18 rue de la Grosse Tour is a perfectly plain, ordinary looking building. 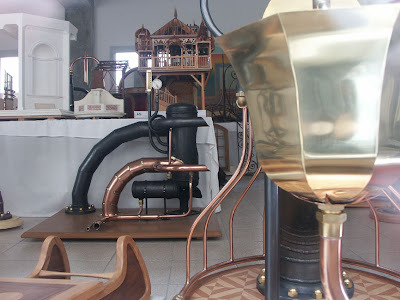 The mini train tour of Tours passes it without comment, but the windows are full of amazing things: what look like structural models in timber, models of tiled roofs, strange items made out of copper and brass. Sculpture? Apprentice pieces? We don't know - the building is unmarked, the letterboxes are only for the residences above, there is nothing I can find on the interwebs, and we didn't even bother asking at the Tours tourist office (who appear to resent being woken up by silly people asking questions). The pieces perhaps have some connection to the Musée de Compagnonnage, as similar pieces are displayed there. So there you go - a building full of items that I would willingly offer house space to (and that's a rarity!) and I can find out nothing about it. The photos were taken at very slow shutter speed, without a flash, with the camera lens pressed against the glass in lieu of a tripod. You can see the reflection of the lens. On Monday evening as I was on my way down to the orchard, Monsieur Q waylaid me, instructing me to wait, as he had something for me. He disappeared back into his house and returned with a little sachet of dried saffron strands. He said that the saffron was blooming right now, and if I wanted to see it I needed to get round to the Mériguet's place that day or the next. Not wanting to miss an opportunity, I went round there immediately. Madame Mériguet was standing at the front gate waiting for me, so I assume Monsieur Q had telephoned her to let her know. They had just finished taking the gorgeous orange-red stigmas from the flowers that had been picked that morning, and had it laid out on kitchen paper towel placed on their mantelpiece. It's left there for about a day to dry out, then transferred to jars to cure for some months. Saffron's distinctive aroma takes some time to develop, and the difference between this year's harvest and last year's was very marked. The fresh stuff is mildly scented, and slightly musty. 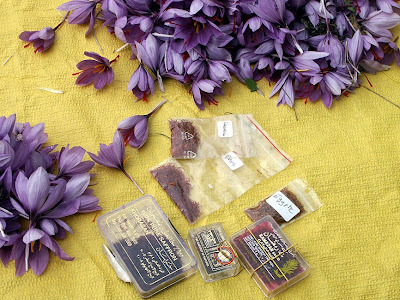 Good quality aged saffron has an undescribable aroma, powerful, rather sharp and medicinal. One of the most economical but tasty ways the Mériguet's use it is to liven up supermarket-bought sablés (butter biscuits, a bit like shortbread). They layer saffron and biscuits in a tin and allow the biscuits to absorb the flavour and scent of the saffron. The biscuits are ready after a few days, and the saffron can be used in other dishes. 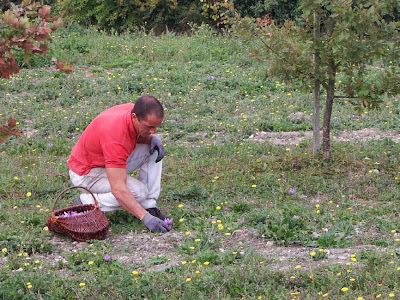 Monsieur Mériguet took up saffron growing when he retired as a decorator and restorer specialising in paint effects. He has become a considerable expert in all aspects of saffron's history, cultivation and culinary uses. (By his own admission, he knows much less about saffron as a dyestuff.) He has been instrumental in the revival of the Foire au Safran in Preuilly. After giving me a potted history of saffron (the bulbs arrived in France brought by the Romans or Greeks to the port of La Rochelle, then came up the big rivers into the Touraine, where it was a major crop in the later Middle Ages, used right up to modern times for all sorts of things from a gum-salve for teething infants to a stain used in microscopy, very expensive, very labour intensive to produce) I was then invited back the next day to go and look at the harvest. 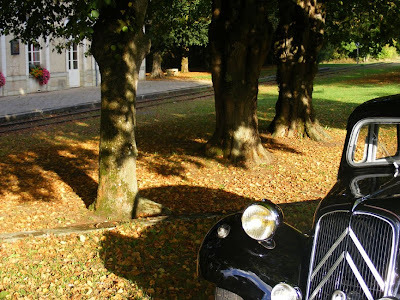 The next morning Monsieur Mériguet drove us out of town a short way, to an old farmhouse surrounded by rows of young oak trees. The oaks are connected to Monsieur Mériguet's other passion – truffles. The saffron is grown in bands between the rows of oaks. The soil is lightly cultivated (no more than harrowed or scarified) for the saffron. Monsieur Mériguet explained that you need soil that is argile-calcaire (clay-chalk) and the bulbs must be planted quite deeply – at least 15cm. This is because the stigma is formed in the tube of the flower, which comes up directly from the bulb - the longer the tube, the more saffron you get. They need to be harvested in the morning, as by mid-afternoon they are wilting. The flowers are carefully picked by hand into a basket designed for the task. It has sloping sides that turn back to partially cover the basket. This is because the flowers are so light that the slightest breeze would blow them out of a conventional basket. 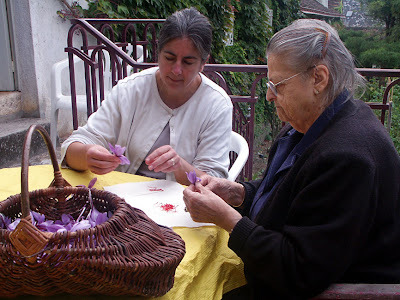 Once picked, the basket of flowers was taken back to the house and we sat around the table pulling off the precious stigmas and discarding the lovely purple flowers. Madame Mériguet demonstrated the technique, which is to gently pull all three stigmas together at the tips with one hand, whilst neatly nipping them off just before they join to form the style with the other hand. It is important to only take the deep red part of the stigma, as the yellowy part at the base does not have a good flavour. 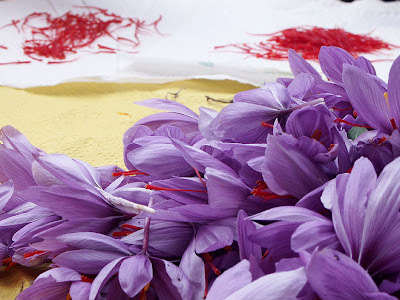 An easy way of judging the quality of saffron in a shop is to check how much yellow there is on the base of the strands. The Mériguet's warned us that many producers include all the yellow stigma bases and style, as it adds bulk. They also said that saffron powder is never the real thing (turmeric is the usual substitute). near the local saffron for quality. With five of us dismembering flowers, the job was done in no time, and we were offered an apératif. This turned out to be a crémant (champagne style wine) from their own vineyard. We were given another little sachet of saffron strands, and now I can't wait for our own saffron, down at the potager, to produce some flowers (they are just poking their noses above ground after the recent rain).